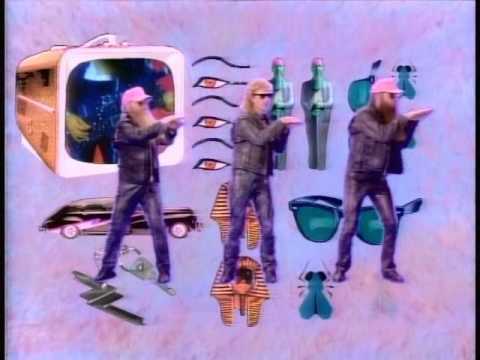 The dance sensation that did not sweep the nation: Dusty Hill, Frank Beard and Billy Gibbons of ZZ Top try to turn the world on to the Velcro Fly. During the Golden Age of Music Video, many artists found a delivery system for their persona, others found an outlet for their creative expression, and some found a way to sell millions of records. Some found all three. Nevertheless, artists would also occasionally use the music video medium to try something different or daring, maybe a curve ball, for whatever reason. Here we present a few memorable music videos that showed us a different side to some of our favorite rock icons. Bruce Springsteen’s one-two punch of releasing his albums Human Touch and Lucky Town spawned a few trademark Boss hits, but he slipped in a little commentary on the dearth of good programming on cable in this dark synth-y ditty. Biting the hand that feeds you a bit, Bruce? Smoke & mirrors-employing director Matt Mahurin shot this clip for the former (and recurring) Van Halen frontman. A bluesy harmonica-laden ramble harkens to a vaudevillian era where Diamond Dave sports no high kicks or bikini babes. A pleasant respite. The Lil Ol’ Band from Texas pulled synthesizer into their boogie shuffle on their Eliminator album, and then poured it all over everything on their follow-up Afterburner. The album went multi-platinum on the strength of the singles “Sleeping Bag”, “Stages”, and “Rough Boy”, and a weird song called “Velcro Fly” whose video played upon similarities to the Bangles’ “Walk Like An Egyptian”. Incidentally, the choreography was by the one and only Paula Abdul, so now you know where to send those letters. This video, another Matt Mahurin project, was a strange tale of feral humans on the loose in the wild. The premise seems as primal as Fogerty’s vocals, but didn’t result in a hit, just a lot of head-scratching and industry tales of shooting naked male dancers with strategically-placed bandages. Mark Rezyka brought his signature L.A. rock video directing style to this clip, which borders on self-satire. Kevin Cronin and company are looking at each other like they think they’re Poison. Not a hit, and a weird misstep. The king of the nightmares switched gears for this droning, new wave departure. Alice looks bad as usual, but resembles an emaciated Che Guevara. Pretty hooky synth riff, though.